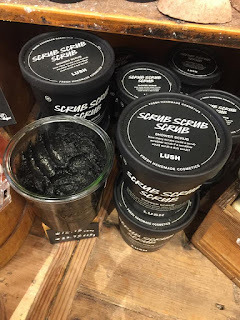 Welcome to a brand new post, I thought that today, I would talk to you all about the new 'Scrub, Scrub, Scrub' from Lush, that was released to all stores in the past couple of weeks. 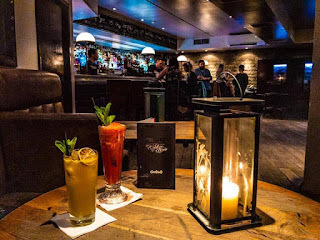 Side note: is anyone at Lush Showcase, this weekend? The Sea Salt helps to give the skin a good but not too harsh scrub (which makes this product good for dry and maybe slightly sensitive skin. The Blackberry, Lime and Blackcurrant gives the product, an uplifting and fruity scent. If you've been to Lush before, then think The Comforter but deeper. The Charcoal helps to scrub the skin, but also helps to mattify the skin. It also gives it a lovely black colour. The Pine and Rosemary help to deepen the fruitiness that is in the product. The texture of Scrub, Scrub, Scrub, is a weird one to explain unless you've used a Lush scrub before. It's a sort of a scrubby wet sand texture, but black in texture. It's thick but not too thick that you're spending twenty minutes scooping some out, and it's not too thin where you scoop it and it just drips off. It has a fine scrub but you can definitely feel it. It definitely does the job. I feel like its a great one to use at nighttime when you don't want to be scrubbing five layers of skin off. I hope that you have enjoyed this post. Are you going to the Lush Showcase this weekend? If so, then I might see you on the Sunday!